Northwest Group...A Xerox Company: BLACK...It Really is a COLOR! BLACK...It Really is a COLOR! It may surprise you, but black is one of the hardest colors (shades) to match. When printing in CMYK (Cyan, Magenta, Yellow, Black), different values are needed to give "Black" a certain appearance on the page. For example, a 'Warm Black' would have more Red in it than other colors, or a 'Cool Black' would have more Cyan in the mix. If you have a large object on a page and only use 100% K (Solid Black), it will appear dark grey rather than a deep black. This is due to the saturation level achievable by the ink or toner on the paper. If you are printing the page in full CMYK color, you can achieve a deeper, richer looking black by leveraging the use of the other CMY colors. If you blend; C 50, M 30, Y 30 , K 100, you will achieve a 'deeper RICH black' that will be perceived as 'cooler' because it has more cyan in the mix. If you blend; C 30, M 50, Y 30 , K 100, you will achieve a 'deeper RICH black' that will be perceived as 'warmer' because it has more magenta in the mix. The term 'RICH' is used to enforce the notion that more colors were used to make black, so it's been enriched. The term "solid black" refers to the color generated from the used on K "black only" ink or toner. 'Solid Black' is best used for text, lines and thin graphical elements, which help to maintain hard, crisp and clean edges. If you choose to use 'RICH' Black, any minor mis-registration within the printing process will make these objects appear soft edged, lacking clarity. When using software within Microsoft's Office Suite (Word, Excel, PowerPoint, Publisher) all color is defined in RGB (Red, Green, Blue), not CMYK. Black is defined with a value of R 0, G 0, B 0. The trouble with RGB is that it is a Display (Monitor) Color language, not a Print Color language like CMYK. If you want to print your file in black and white, you must select 'Grayscale' within your print driver for it to generate a black and white service click. 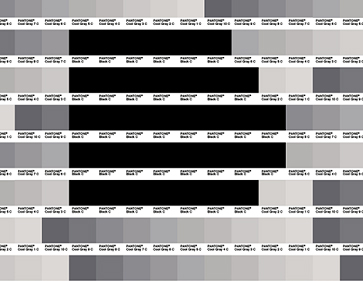 If you let your Postscript print driver convert color for you, it will convert RGB Black to CMYK value of C 89, M 83, Y 78, K 100, which generates a color service click when 'Grayscale' is not manually selected. Adobe Systems, Microsoft's leading software competitor, chooses to define Black within it's software (InDesign, Illustrator, Photoshop) using the CMYK Color language, setting Black to K 100. So, when printing files which only using Adobe Black, a black and white service click, whether you select 'Grayscale' or not will always be generated. Today a pinch of Black Pepper is added to almost every type of recipe imaginable. Once used as currency and presented to the gods as a sacred offering, it is fortunate that this most popular of spices is now readily available throughout the world. There is no question that the vehicle you drive is an extension of your personality — According to the experts, the message you send by driving a Black vehicle is your empowered, not easily manipulated, love elegance, and appreciate classics.